The Protect-A-Mat Auto Floor Mat from IntroTech is Crystal Clear perfection. Intro-Tech Automotive has been around making premium quality automotive aftermarket accessories, including their Protect-a-Mat auto floor mat, in Southern California since around 1991. The company licenses many elements of the GM product line as just one example of the committment to customer needs. The latest CAD CAM systems are used in the design and manufacturing processes that start with only the finest of raw materials. All the company's products come with lifetime warranties. Can you ask for more? 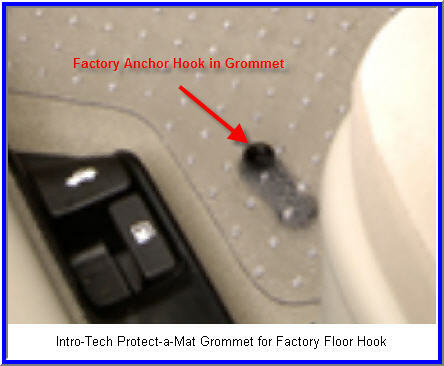 The Protect-a-Mat Auto Floor Mat from Intro-Tech may be cut into any one of 10000+ different patterns to fit your vehicles floor in a precise and exacting manner. But, maybe you don’t like all this precision, or, you want a clear car mat shaped like a pumpkin, or a royal carriage! Whatever shape you want, within reason, I’m sure, Intro-Tech will cut for you. You have to send them the pattern and it’s probably best to call just to make sure they can really carve the right smile for you. All joking aside, this is a top quality car mat with ultra premium vinyl construction, a textured top to keep your feet steady, five 1/4 inch nibs per square inch on the mat bottom to prevent slippage and it won’t crack, curl or harden even in sub-freezing temps. It’s a great choice to protect your existing Intro-Tech carpeted mat or just use this honey as your main mat. 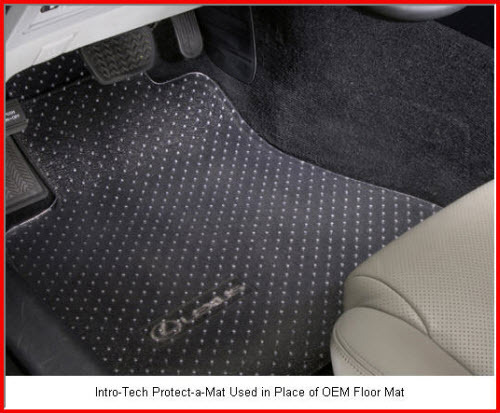 If you are using the Protect-a-Mat as a standalone mat, i.e., there are no other car floor mats above or below it, you may want to use universal absorbent mats to keep water and other gunk that lives on top of rubber/plastic mats from getting on your footwear.